The Association of Air Ambulances Charity relaunched as Air Ambulances UK on Friday 23rd November, signalling the start of an exciting new era of strategic growth in which it aims to significantly increase the level of national funding provided to its 21 beneficiary air ambulance charities across Great Britain. The new working name and brand will help the Charity to secure more valuable fundraising partnerships with national organisations, major donors and trusts and foundations by presenting a highly professional, impactful and engaging identity. Following the launch of the new working name and identity, the next phase of development will see the Charity implement a strategic approach to creating more national partnerships through continued collaboration with air ambulance charities, tactical market segmentation, diversification in the types of partnerships it enjoys and harnessing innovative digital technology. 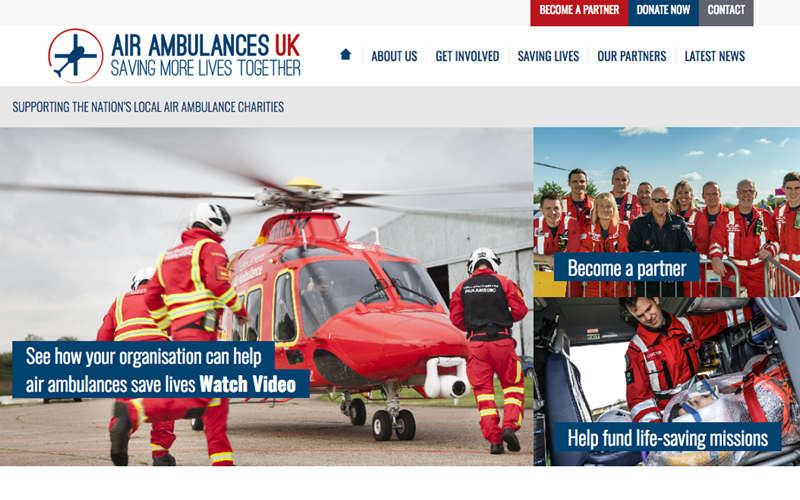 Since it was founded in 2015, Air Ambulances UK has raised nearly £7,000,000 to support the life-saving work of the nation’s air ambulance charities. Its current partnerships include its Principal Partner, Allianz, as well as the Government’s Valuation Office Agency, Costcutter and Communisis.